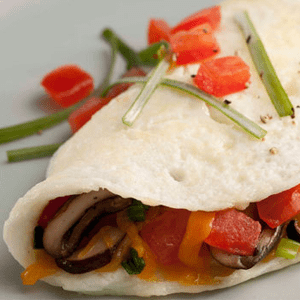 Power-up your morning with this protein-packed egg white omelet! Combine egg whites with pepper (if desired) in a small bowl; whisk to blend. Set aside. Heat a small nonstick skillet, lightly coated with spray, over medium heat. Add mushrooms, green onion, and tomato; cook for 4 to 5 minutes, or until soft. Remove from skillet. Place eggs in skillet; cook over medium-low heat. Do not stir. As eggs set, lift edges, letting uncooked portion flow underneath. 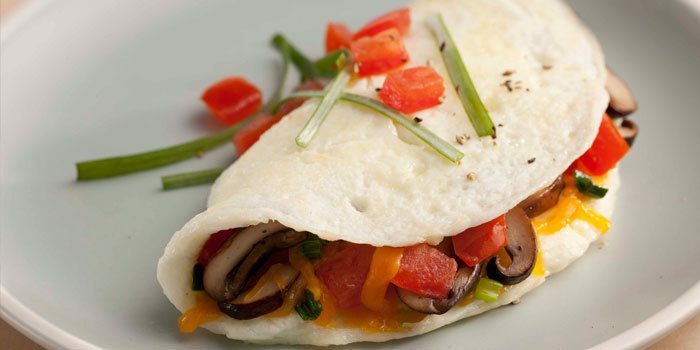 When eggs are almost set, add mushroom mixture and cheese; cook for 1 to 2 minutes, or until cheese starts to melt. Gently fold in half. Garnish with green onion and tomato.